6% Molybdenum Superaustenitic Stainless Steel with Outstanding Resistance to Chloride Pitting, Crevice Corrosion and Stress-Corrosion Cracking. Alloy SSC-6MO (UNS N08367) is comparable to and competes directly with AL6XN®. SSC-6MO (UNS N08367) is a superaustenitic 6% molybdenum alloy that exhibits far greater resistance to chloride pitting, crevice corrosion and stress-corrosion cracking than the standard 300 series and standard duplex stainless steels. It also serves as a cost-effective substitute for more expensive nickel-base alloys in applications where excellent corrosion resistance, strength, formability and weldability are essential. Designated as (UNS N08367), SSC-6MO competes directly with Alloy AL6XN®. The high nickel (24%) and molybdenum (6.5%) contents contribute to the alloys chloride stress-corrosion cracking resistance, while the molybdenum content also provides resistance to chloride pitting. The high levels of chromium (21%), molybdenum and nitrogen (0.22%) all serve to produce exceptional corrosion resistance. Due to its high nitrogen content, SSC-6MO has higher tensile strength than the common austenitic stainless steels. The ASME design-stress allowances for SSC-6MO are up to 75% higher than 316L and more than two times those of the copper- nickel alloys. The toughness and ductility of SSC-6MO provide for ease of fabrication. SSC-6MO welds and forms much more readily than any super duplex or high alloy ferritic stainless steel with comparable corrosion resistance. 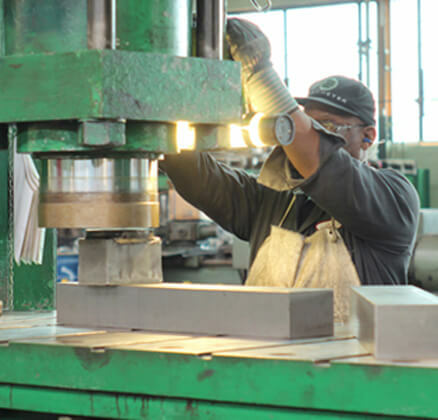 One of the advantages of nitrogen-enriched stainless steels such as SSC-6MO and duplex alloys is their higher strength levels in comparison to conventional austenitic stainless steels. Higher strength levels, coupled with the corrosion resistance of SSC-6MO, allows for construction of units with thinner cross-sections. SSC-6MO is rated for stresses over 66% higher than 316L at 200°F. It also maintains its strength at high temperatures. SSC-6MO is readily fabricated using standard practices for austenitic stainless steels. The most frequent cause of corrosion failures in stainless steels is localized attack induced by chlorides; specifically, pitting, crevice corrosion and stress-corrosion cracking. SSC-6MO is positioned as an upgrade to austenitic stainless grades such as 316L, 317L and 904L. It is also superior to Alloy 20 and Alloy 825 in resistance to a wide range of corrosive environments. SSC-6MO is also found to be a cost effective substitute for higher cost nickel-base alloys such as alloys G, 625, 276 and titanium for many applications. The pitting resistance of an austenitic stainless steel can be related directly to alloy composition, where chromium, molybdenum and nitrogen are a weight %. The Pitting Resistance Equivalent Number (PREN) uses the following formula to measure an alloy’s relative pitting resistance - the higher the number, the better the pitting resistance. The high level of molybdenum and nitrogen present in SSC-6MO has a beneficial effect on crevice corrosion resistance in chloride-bearing, oxidizing, acid solutions. SSC-6MO also has better crevice corrosion resistance in seawater than 316L, 2205 and 904L. Chloride stress-corrosion cracking (SCC) is one of the most serious forms of localized corrosion. Higher temperatures and reduced pH will increase the probability of SCC. It has been determined that alloys become more resistant to SCC as their nickel content increases above 12% and their molybdenum content rises above 3%. SSC-6MO is superior to the standard 300 series austenitic stainless steels and some duplex stainless steels. SSC-6MO is very resistant to SCC at temperatures less than 250°F (121°C). The threshold temperature for initiating SCC increases with decreasing chloride content. Caution must be used when selecting this alloy for applications where temperatures may be higher than 250°F (121°C). Chloride stress-corrosion cracking (SCC) is one of the most serious forms of localized corrosion. Higher temperatures and reduced pH will increase the probability of SCC. It has been determined that alloys become more resistant to SCC as their nickel content increases above 12% and their molybdenum content rises above 3%. SSC-6MO is superior to the standard 300 series austenitic stainless steels and some duplex stainless steels. SSC-6MO is very resistant to SCC at temperatures less than 250°F (121°C). The threshold temperature for initiating SCC increases with decreasing chloride content. Caution must be used when SSC-6MO is excellent in acetic, formic and phosphoric acids, as well as, sodium bisulfate. It is satisfactory in oxalic acid, sodium hydroxide and sullfamic acids but unsatisfactory in 10% sulfuric acid solutions. The overall general corrosion resistance of SSC-6MO in boiling test solutions is superior to 316L and 317L, and comparable to 904L and 276. The resistance of SSC-6MO to dilute (less than 15%) sulfuric acid at all temperatures up to the boiling point and to concentrated (greater than 85%) solutions at low temperatures is good for an austenitic stainless steel. In pure sulfuric acid, SSC-6MO performs significantly better than 316L and somewhat better than 904L. Its performance is comparable to the more costly nickel-base materials – Alloy 20 and Alloy 825. In phosphoric acid process streams that contain halide impurities, the superior resistance of SSC-6MO is required. The alloy also resists concentrations above 45% where Alloy 20 and Alloy 825 are usually utilized. AL6XN® is a registered trademark of ATI Properties Inc.electing this alloy for applications where temperatures may be higher than 250°F (121°C).